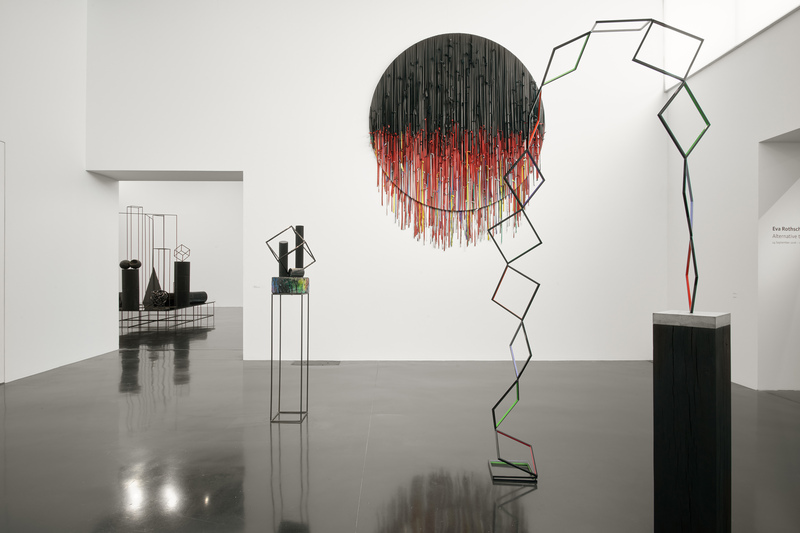 Eva Rothschild, Alternative to Power, (installation shot), The New Art Gallery Walsall, 24 September 2016 – 15 January 2017. 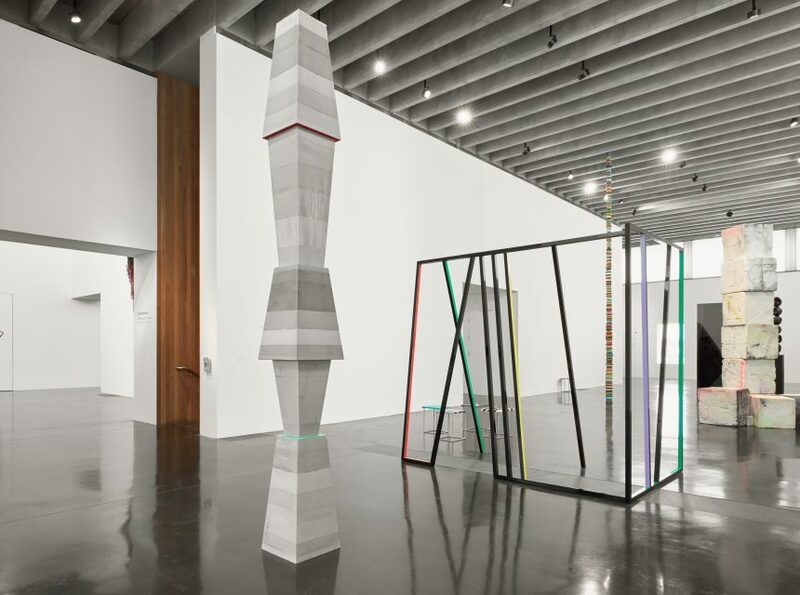 Eva Rothschild’s display at New Art Gallery Walsall, whose high ceilings and polished black floors feel like they have been made for the artist’s works, was a beautifully balanced one. 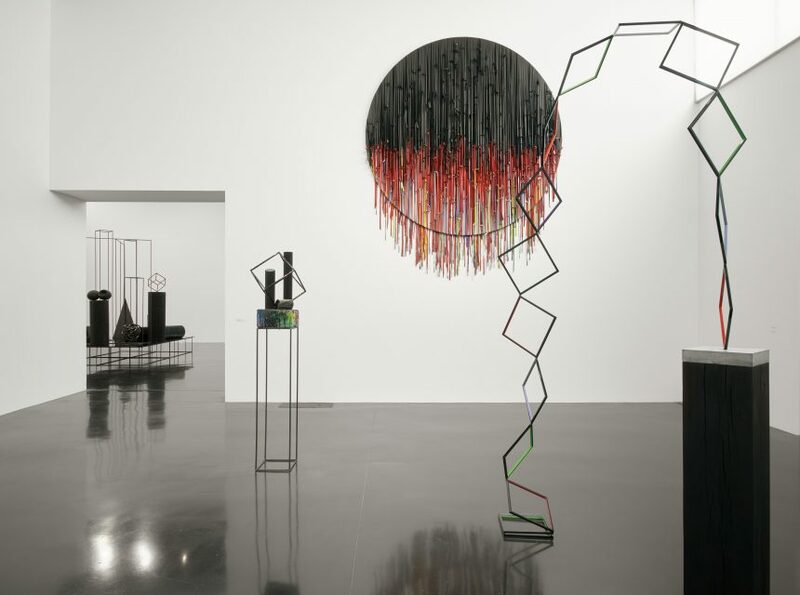 Featuring two newly commissioned pieces made during this summer’s EU referendum campaign, works such as RedSun, An Array, Ruins and Technical Support (all 2016) typically employed an economy of material, relying on balance and precision to achieve formal tension through texture, form, and vibrant colour paired with black. Generously punctuated with seating that acknowledged the viewer, this was an elegant, resonant and timely politicised exhibition. 24 September 2016 – 15 January 2017. “What are monuments?” asks the British artist Idris Khan, designer of the memorial that will act as the focus for Commemoration Day on November 30. Khan, 38, has certainly invoked that sense in the 90-metre sculpture that now stands at the heart of the newly-named Wahat Al Karama, a 46,000 square metre site that sits between the Sheikh Zayed Grand Mosque and the headquarters of the UAE’s Armed Forces. Made from 31 aluminium-clad tablets, the tallest of which is 23 metres, Khan’s sculpture overlooks a wide memorial plaza that doubles as a reflecting pool and leads to a smaller, circular structure, The Pavilion of Honour. The Pavilion contains the names of each of the nation’s heroes who, from the time of the UAE’s unification in 1971, sacrificed their lives in the service of their country. Each name is inscribed on its own panel, made from aluminium reclaimed from Armed Forces vehicles. A graduate of London’s Royal College of Art, the sculptor came to wider public attention thanks to Seven Times (2010), an installation of steel cubes sandblasted with layered Arabic inscriptions, and You and Only You (2012), a mural formed from fragments of pilgrims’ responses to the experience of performing Haj. Both works were displayed as part of the British Museum’s 2012 exhibition Haj: Journey to the Heart of Islam. But the memorial is the largest work Khan has ever undertaken. It is made from hundreds of tonnes of steel, and its 31 tablets and central spine are covered in over 1,000 hand-painted, individually cast aluminium panels. Some of the panels bear poetry from the UAE’s founder, the late Sheikh Zayed, while the monument’s spine is inscribed with the pledge of allegiance sworn by all members of the UAE’s Armed Forces. “I wanted to create an entrance into the piece so that as you enter, you get a real sense of scale. 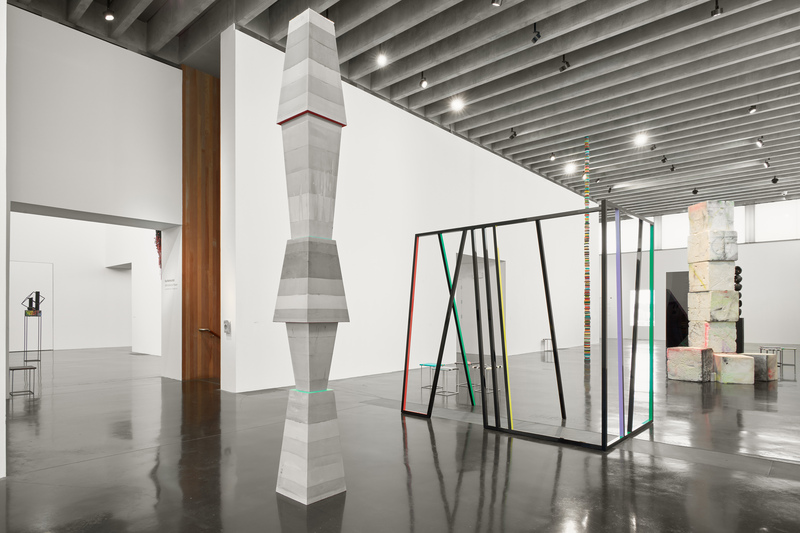 You walk into the piece and there’s an immediate difference in temperature,” the artist says. 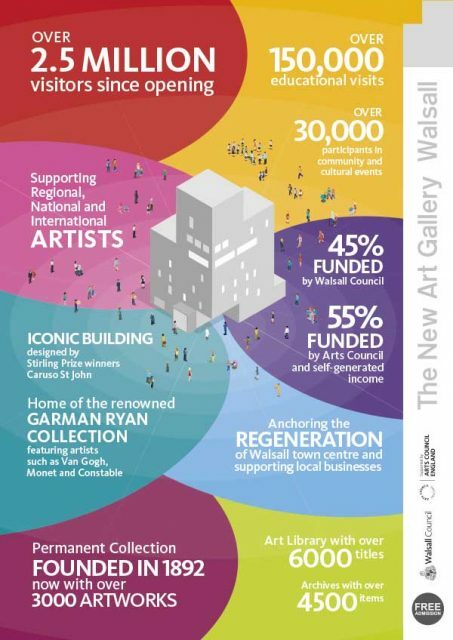 The New Art Gallery Walsall – did you know……. It’s now the last chance to see the first of a series of displays featuring work by artists who are also staff members in the Costa cafe on the ground floor of the Gallery. Wish Factory, by local artist Michele Harris, launched the series and is also accompanied by the unveiling of her first new work in several years on the Gallery’s Mezzanine. 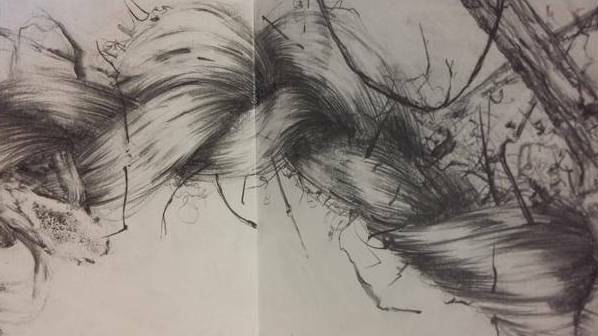 We are delighted to announce that Umbilical, her new drawing, has now been acquired for The New Art Gallery’s Permanent Collection. Michele has worked at the Gallery since 2000 both as a Gallery Assistant and Artist Educator. In August 2014 she suffered a brain haemorrhage whilst at work, which left her hospitalised for six weeks. She also temporarily lost her eyesight and endured several operations and a long rehabilitation process, until she was able to return to work at the Gallery in May 2015. This year Michele began to make new artwork and Umbilical is her first completed new drawing. In her artist statement about the work Michele said: Umbilical, is a very significant work for me as it was the first work I completed since my brain haemorrhage. This left me blind for a while, and I didn’t know if I’d see again, let alone be able to draw. Umbilical is about my relationship with my 5 year old daughter Poppy. She has always been fascinated and comforted by my hair, especially when it is plaited. Braids often were a symbol of fertility and it seems fitting that it has become a talisman for Poppy, which induces a sense of calm and security. Visually it became a symbol of the connection and interdependence between us that in form resembles the umbilical cord. 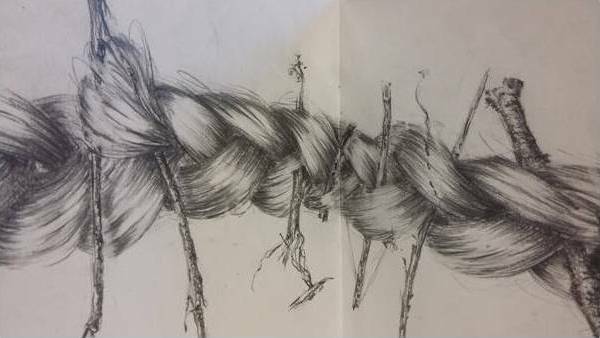 In the drawing the braid is becoming tangled and cluttered with twigs that eventually overtake it and become a nest-like form representing nurturing protection. 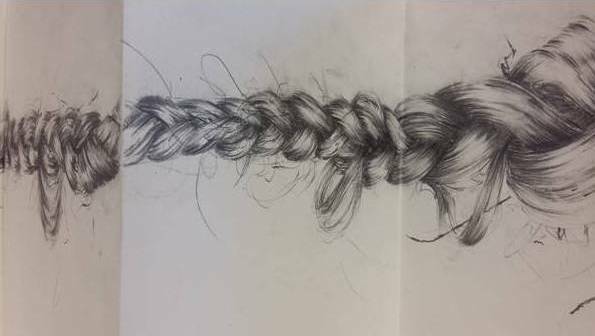 A lot of the twigs and branches I used for inspiration were collected with Poppy on the school run and I made sure that the plaits I referenced were from toys like Anna and Elsa from Frozen or My Little Pony manes and tails. It represents playfulness and innocence and also the pain of accepting that had I not survived she may have had to rely on the toy plaits as a substitute. Michele’s work explores the shadowy corners and ambiguities associated with innate elements of the human condition – hope, despair, wishing, sacrifice, bliss, the fear of living and the fear of dying. The symbols used in her work are rooted in the rich tradition of myth and superstition. Narratives form and the objects on which the works are based begin to symbolise transformations and metamorphoses from incarceration to freedom, despair to hope, life to death. 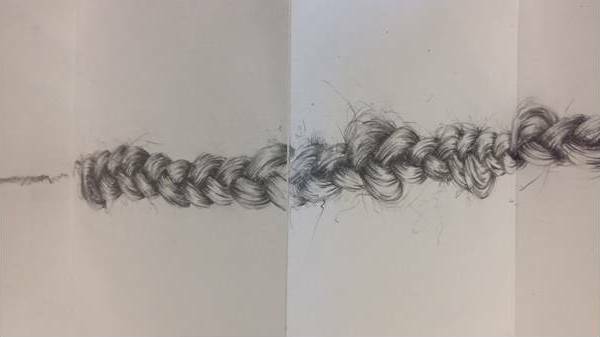 A group of A Level and GCSE students from Ockbrook School in Derbyshire took part in a hands-on art and sculpture masterclass led by expert artists at The New Art Gallery Walsall in the West Midlands. People’s Choice – Have you voted yet? To celebrate the 125th anniversary of our Permanent Collection in 2017 and the launch of our new online collections database we are inviting you to curate next year’s collections exhibition, which will open in March. Two History of Art students from the University of Birmingham are now undertaking work placements with us at the Gallery to help promote this exhibition. 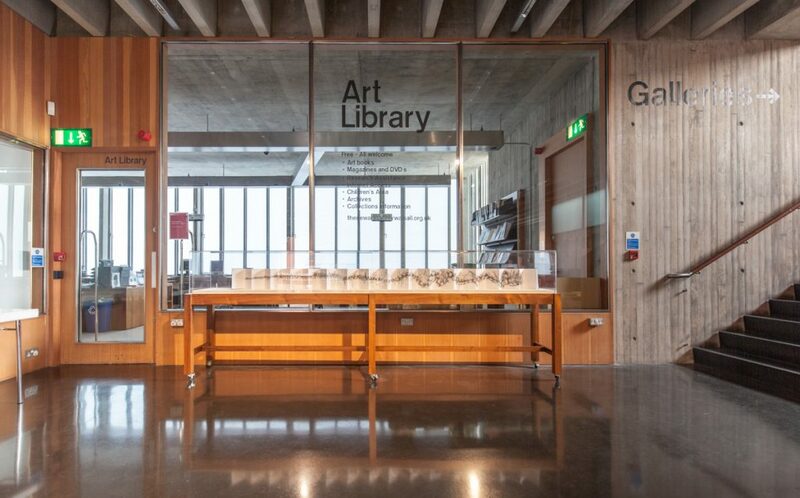 Aelita and Jessica will be in and around the Gallery for the next few months encouraging visitors to vote for their favourite artworks, both via Ipads in the Garman Ryan galleries and in our Art Library. 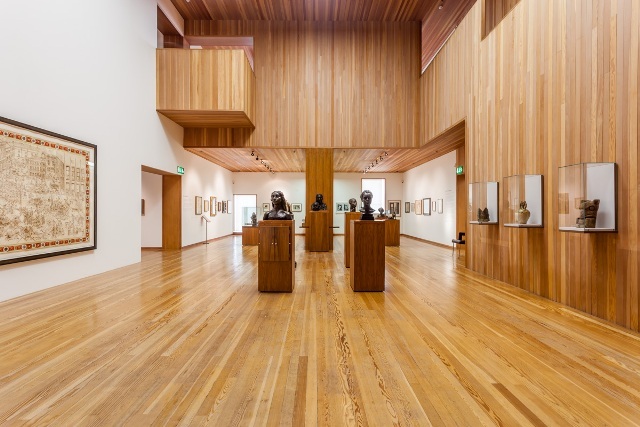 They will also be helping with ideas on social media to illustrate the breadth and scope of our Permanent Collection. This is your opportunity to take ownership of the collection displays! Voting is now open and will close at the end of January. Alternatively you can vote via postcards available in the Gallery. We will display the most popular works in our themed collection galleries next year. Don’t miss out on this opportunity to see your favourites on display! Thank you to everyone who has sent messages of support over the recent weeks. Walsall Council has been asked to make savings of £86 million over the next four years. 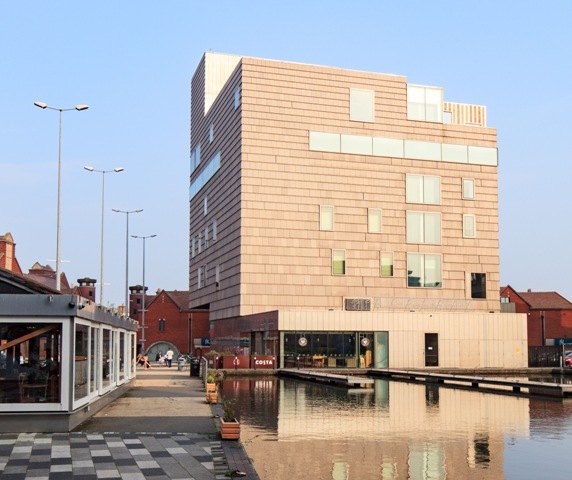 As part of the proposals to achieve this, the Council has proposed reducing funding to The New Art Gallery Walsall to zero by 2020. The Gallery’s core funding is currently awarded through a partnership between Walsall Council and Arts Council England, and further subsidised through grants, foundations, partnerships and commercial activity. How the saving proposal impacts on them and whether they have alternative suggestions for how this saving can be made and provide any other comments they want to make. Feedback submitted by letter, email and the online survey https://surveys.walsall.gov.uk/s.asp?k=147741448313 will be collated via methods agreed by Chris Holliday, Head of Leisure Culture and Operations, Walsall Council. Public consultation is now underway for the proposals put forward by Walsall Council. To comment on the proposals concerning The New Art Gallery Walsall you will need to enter number ‘36’ when asked for the ‘Saving Reference Number’.